Rehydrates dry, chapped or chafed skin. May be used alone as a skin lubricant or protectant. 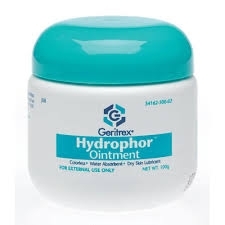 Hydrophor™ provides long-lasting moisturization and relief of severely dry skin. It works by creating a protective barrier that conditions skin as it prevents moisture loss. Apply generously to affected areas or as directed by your physician.